It is the third live-action theatrical film featuring Aquaman, following Batman v Superman: Dawn of Justice (2016) and Justice League (2017), and the first full-length feature film centered around the character. In Aquaman, Arthur Curry, the heir to the underwater kingdom of Atlantis, must step forward to lead his people against his half-brother, Orm, who seeks to unite the seven underwater kingdoms against the surface world. Development of an Aquaman film began in 2004, with several plans falling through over the years. In August 2014, Beall and Kurt Johnstad were hired to write two competing scripts and the film was officially announced in October 2014. Wan signed on as director in April 2015 and in July 2016 it was announced the film would move forward with Beall’s screenplay, although Wan, Johnstad, Johns and Johnson-McGoldrick all performed various rewrites. The main cast was confirmed throughout 2016 and early 2017. Principal photography began in Australia on May 2, 2017. Most of the film was shot at Village Roadshow Studios in Gold Coast, Queensland, with production also held in Canada, Italy and Morocco, and wrapped on October 21, 2017. In 1985 in Maine, lighthouse keeper Thomas Curry rescues Atlanna, the princess of the underwater nation of Atlantis, during a storm. They eventually fall in love and have a son named Arthur, who is born with the power to communicate with marine lifeforms. Atlanna is forced to abandon her family and return to Atlantis, entrusting to her loyal advisor Nuidis Vulko the mission of training Arthur. Under Vulko’s guidance, Arthur becomes a skilled warrior but is rejected by the Atlanteans for being a half-breed and ultimately leaves Atlantis behind. Orm visits Arthur in captivity and announces that Atlanna was executed for the crime of having a half-breed son, blaming Arthur and the surface for her death. He offers Arthur an opportunity to leave forever, but Arthur instead challenges him to a duel in a ring of underwater lava. Orm gains the upper hand and nearly kills Arthur before Mera rescues him. Together, Arthur and Mera journey to the Sahara desert where the trident was forged and unlock a holographic message that leads them to Sicily, where they retrieve the trident’s coordinates. Meanwhile, Orm provides David with Atlantean armor and weaponry and sends him to stop them, imprisons Vulko upon learning of his betrayal, and coerces the remaining kingdoms of Atlantis to pledge allegiance to him and his campaign against the surface. In Sicily, David, now calling himself Black Manta, ambushes Arthur and Mera and injures Arthur before being thrown off a cliff to his apparent death. Mera nurses Arthur’s wounds as they journey to the trident’s whereabouts, and encourages him to embrace his destiny as a hero. Arriving at their destination, Arthur and Mera are attacked by a legion of amphibious monsters known as The Trench, but manage to fend them off and reach a wormhole that transports them to an uncharted sea located at the center of the Earth. There, they are unexpectedly reunited with Atlanna, who was sacrificed to the Trench for her crimes but managed to escape and reach the uncharted sea, where she has been stranded ever since. Arthur faces Karathen, the mythical leviathan that guards the trident, and voices his determination to protect both Atlantis and the surface, proving his worth and reclaiming the trident, which grants him control over the seven seas. Arthur, Mera, and Atlanna lead an army of marine creatures in battle against Orm and his followers, who renounce their obedience to Orm and embrace Arthur as the true king upon learning he wields the trident. Arthur defeats Orm in combat, but chooses to spare his life and Orm accepts his fate after discovering Arthur has found and rescued their mother. Atlanna returns to the surface to reunite with Thomas while Arthur ascends to the throne with Mera by his side. A half-Atlantean/half-human who is reluctant to be king of the undersea nation of Atlantis. He has the ability to manipulate the tides of the ocean, communicate with other aquatic life, swim at supersonic speeds, and possesses superhuman strength. A younger Arthur Curry is portrayed by various actors including an uncredited infant, Tainu and Tamor Kirkwood at three-year-old, Kaan Guldur at 9-year-old Arthur, Otis Dhanji at 13-year-old Arthur and Kekoa Kekumano at 16 year old. Atlantis’ counselor who would become a mentor of Arthur Curry when he first comes to Atlantis. The king of the Atlantean tribe of Xebel and Mera’s father who allies with Orm. Additionally, Graham McTavish portrays Atlan, the ancient king of Atlantis who is the ancestor of Atlanna, Orm and Arthur; Temuera Morrison portrays Thomas Curry, a lighthouse keeper who is Arthur Curry’s father; Ludi Lin portrays Murk, the Captain of the Men-of-War, the frontline army of Atlantis; Randall Park portrays Dr. Stephen Shin, a marine biologist who was friends with Thomas Curry and wants to find Atlantis; and Michael Beach portrays Jesse Kane, a member of a group of boatjackers and David Kane’s father. Djimon Hounsou, Natalia Safran, and Sophia Forrest play the Fisherman King, the Fisherman Queen, and the Fisherman Princess respectively, whom Orm creates an alliance with as part of his plan to unite the seven kingdoms of the sea. Leigh Whannell, Wan’s long time collaborator, appears in the film as a plane pilot. Julie Andrews provides the voice of Karathen, a mythical leviathan that allies with Aquaman. In 2004, FilmJerk.com reported that Sunrise Entertainment’s Alan and Peter Riche planned to bring Aquaman to the big screen for Warner Bros. with Robert Ben Garant writing the screenplay. However, the film fell through. In July 2009, it was reported that Aquaman was in development at Leonardo DiCaprio’s Appian Way. Warner chairman and CEO Barry Meyer said that the Aquaman film was in development. A source from Warner Bros. told The Wrap that they were discussing the possibilities, with the mention of more Man of Steel movies as well as a Superman/Batman film, a Wonder Woman film, and an Aquaman film. Geoff Johns told Variety that Aquaman is a priority character for the company. 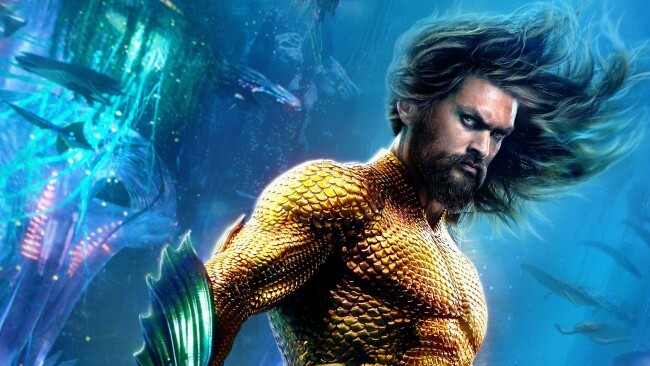 It was announced on August 12, 2014, that Warner Bros. had hired screenwriters Will Beall and Kurt Johnstad to pen two separate scripts for an upcoming Aquaman film. The film was being developed on dual tracks, meaning that two scripts were written, one by Beall and one by Johnstad, but only the better version would move forward. On April 10, 2015, The Hollywood Reporter reported that James Wan was the frontrunner to direct the film. In June 2015, Wan was confirmed to direct the film and overlook the screenplay by Johnstad. On November 12, 2015, David Leslie Johnson-McGoldrick was hired to write the script, however it was unclear whether he would be writing a separate script or working with Wan. It was then revealed that previous script plans had been scrapped and that both Wan and Johns planned to move forward with a new script written by screenwriter Will Beall. Later, Johnson-McGoldrick was brought back to the project to work on a rewrite of Beall’s script. On March 2016, it was announced that the events of Aquaman will be set after Justice League. Wan confirmed later on Twitter that cinematographer Don Burgess, who previously worked with Wan on The Conjuring 2, will serve as cinematographer for Aquaman. Pre-production began in Australia in late November 2016. On October 20, 2014, in an interview with ComicBook.com, Jason Momoa revealed that the Justice League film would be coming first and that’s what they were preparing for, and he didn’t know if the solo Aquaman film would come before or after Justice League. He thought it might be the origin, where Aquaman came from. Warner Bros. announced Aquaman as a part of the DC Extended Universe, with Jason Momoa starring. In December 2014, it was revealed that Momoa had signed a four-picture deal with the studio and DC, and he wanted Zack Snyder to direct the solo Aquaman film. On January 13, 2016, The Hollywood Reporter announced that Amber Heard entered negotiations to play the female lead role of Mera, Aquaman’s love interest; her casting was confirmed two months later. In April 2016, Willem Dafoe was cast in an undisclosed role, later revealed to be Nuidis Vulko. On December 12, 2016 it was confirmed that Patrick Wilson will play the villainous Ocean Master, the half-brother of Aquaman. On January 31, 2017, Yahya Abdul-Mateen II was added to the cast as Black Manta, Aquaman’s archenemy in the comics. That same day, the press reported that Nicole Kidman had entered talks to play Queen Atlanna. Two months later, Kidman confirmed her participation in the film. By February 2017, New Zealand actor Temuera Morrison entered talks to play Thomas Curry, Aquaman’s human father. On April 12, Dolph Lundgren was cast to play Nereus, king of Xebel. Ludi Lin was cast in the film on May 15, 2017. Almost two weeks later, Michael Beach, who voiced Devil Ray, a character loosely based on Black Manta in Justice League Unlimited, was cast as Black Manta’s father. In October 2017, Graham McTavish revealed that he has a role in the film. In April 2018, Randall Park was cast as Dr. Stephen Shin. In July, Djimon Hounsou, Natalia Safran and Sophia Forrest were cast as the Fisherman King, Fisherman Queen and the Fisherman Princess. In November 2018, it was revealed that Julie Andrews has a voice role in the film. Principal photography began in Australia on May 2, 2017, under the working title Ahab. A majority of the film was shot at Village Roadshow Studios in Gold Coast, Queensland with production also held in Newfoundland, Canada, as well as Sicily and Morocco. Between May and August 2017, production also took place on location around a number of places of the Australian Gold Coast including Main Beach, Coomera, Southport and Amity Point in North Stradbroke Island, Queensland, as well as Hastings Point in New South Wales. On filming underwater sequences, Wan stated that “the underwater world is super complicated” and “it’s not an easy shoot”. On August 11, 2017, filming began on the Arthur Curry Lighthouse set at Hastings Point and ended later that month. In September, during an interview with Kiss Radio, actor Ludi Lin described Wan’s vision for the film as ‘Star Wars underwater’. That same month, filming took place in Newfoundland and Labrador. Willem Dafoe finished up his part by late September. On October 13, James Wan announced that Patrick Wilson wrapped on the film. Filming on location took place in the deserts of Morocco by mid-October, which included the cities of Merzouga and Erfoud. Principal photography wrapped on October 21, 2017. James Wan’s five-time collaborator Kirk Morri served as the editor for Aquaman. Two-time Academy Award winner Charles Gibson (Babe and Pirates of the Caribbean: Dead Man’s Chest), and Kelvin McIlwain (The Fast and the Furious franchise) served as overall visual effects supervisors. Rodeo FX, Scanline VFX, Moving Picture Company (MPC), Industrial Light & Magic (ILM), Weta Digital, Method Studios, and Digital Domain provided the visual effects for the film. On November 3, 2018, Wan announced that post-production on the film was complete. On March 7, 2018, Rupert Gregson-Williams was announced as the composer for Aquaman. Gregson-Williams previously wrote the score for Wonder Woman, the fourth film in the DC Extended Universe. The soundtrack was released by WaterTower Music on December 14, 2018. The album features an original song by American musician Skylar Grey entitled “Everything I Need”, written by Grey and Elliott Taylor. The 2nd trailer featured a piece called “Sidewinder” from composer Phil Lober of Ghostwriter Music. In March 2017, a first look at Aquaman was shown prior to shooting during the CinemaCon convention in Las Vegas, Nevada with Momoa introducing a video of director James Wan showing off a concept art sizzle reel for the movie. Later, on July 22, the film’s first footage made its debut at San Diego Comic-Con (SDCC) 2017 with a teaser presented by Momoa during the Warner Bros.’s panel at Hall H; director James Wan presented the footage stating that “in a lot of ways, this is an origin story”, referring to the film. In April 2018, another teaser with new rough footage was shown off by Wan and Momoa at CinemaCon, joined by Amber Heard, Patrick Wilson and Yahya Abdul-Mateen II on stage. In an interview with Entertainment Weekly during the event, Wan teased the conflict between Arthur Curry and his half-brother and main antagonist in the film, Orm / Ocean Master, stating that “it’s almost a very classic Shakespearean story about brother from another world vs. brother from another world. And it really is a classic story of sibling rivalry”. On June 11, 2018, the film’s first trailer was previewed at the European exhibitors’ conference CineEurope in Barcelona, Spain. A first look at Black Manta, Ocean Master, Queen Atlanna and Nuidis Vulko were revealed by Entertainment Weekly on June 14, 2018. The next day, director Wan announced that the first trailer would premiere at San Diego Comic-Con (SDCC) 2018, during the Warner Bros.’s panel. On July 16, 2018, an official teaser poster was released. On July 21, 2018, the first trailer was released at the SDCC 2018, being considered the best received trailer during the international convention; it was attached to theatrical showings of Teen Titans Go! To the Movies, Mission: Impossible – Fallout, The Meg, The Predator, and Venom. The cast also appeared as guests at the late-night talk show Conan with Conan O’Brien during SDCC, on Sunday, July 22. On October 5, 2018, a 5-minute Extended Video was released by Warner Bros. It received positive reactions by audiences, with praise directed towards the special effects, action, cinematography, and faithfulness to the comic book. The first official TV spot for the film was released by the studio on October 16, 2018, followed by a second one on November 1, 2018. The same month, character posters were released for Aquaman, Mera, Black Manta, Ocean Master, King Nereus, Queen Atlanna and Nuidis Vulko. On November 7, 2018, the studio announced the schedule for the worldwide promotion tour, taking place during the months of November and December, with fan events, screenings and premieres in major cities around the globe, including Beijing, London, New York City, Manila, Los Angeles, Miami, Gold Coast, Sydney, and Hawaii. Additionally, it was announced that the film will be screened on December 7, 2018, during Brazil Comic Con (CCXP) in São Paulo. The following week, an official behind the scenes featurette was released, which included footage not seen before in the mainstream trailers. Two days later, the film’s two main posters were released, with Aquaman and Mera showing off their comic-accurate suits. On November 19, 2018, the final trailer for the film was released, alongside the announcement of the ticket sales beginning. The same day, 30 minutes of footage was shown in China during the first stop of the film promotion tour, generating rave reactions among the attendees. Aquaman had its world premiere at the Empire, Leicester Square in London on November 26, 2018. It is scheduled to be released in the United States by Warner Bros. Pictures in RealD 3D, Dolby Cinema, IMAX and IMAX 3D on December 21, 2018. It was previously set for July 27, 2018, and then moved to October 5, 2018, before settling on its December release date. On November 19, 2018, Atom Tickets announced that Amazon Prime members in the United States would have early access to tickets for a December 15 screening of the film at select Regal, National Amusements, ArcLight Cinemas, and AMC theaters. Internationally, the film was released in China on December 7, 2018, in the United Kingdom on December 12, 2018, in Brazil and Russia on December 13, 2018, and in India on December 14, 2018. As of December 23, 2018, Aquaman has grossed $72.1 million in the United States and Canada, and $410.7 million in other territories, for a total worldwide gross of $482.8 million. The day after announcing the early Amazon screenings, Aquaman’s first 24 hour pre-sale totals became the highest in the history of Atom Tickets, beating out Avengers: Infinity War, as well as outpacing Jumanji: Welcome to the Jungle, another film Amazon Prime offered early to subscribers the previous December. On Fandango, it also set the record for number of tickets sold, beating out Venom. The film made $2.9 million from the Amazon preview screenings at 1,225 theaters, higher than the $1.86 million made by Jumanji. In the United States and Canada, Aquaman was released alongside Bumblebee, Second Act, and Welcome to Marwen, and was projected to gross $65–70 million in its opening weekend, and $120 million over its first five days (with some tracking figures going as high as $150 million). The film made $28 million on its first day, including $9 million from Thursday night previews (a total of $13.7 million including the Amazon screenings). It went on to debut to $67.4 million ($72.1 million including the Amazon showings), topping the box office but marking the lowest opening of the DCEU. In China, where the film was released two weeks prior to its US debut, the film made $24.6 million (¥169.5 million) on its first day, representing 86% of the market share and setting a Warner Bros. opening day record in the country. It went on to debut to $93.6 million (¥644.8 million), marking the best-ever opening for the DCEU, Warner Bros. and a December release in the country. It also overtook the entire lifetime gross of Wonder Woman in just three days. The film grossed $12.99 million on Monday, making it cross $100 million ($107.7 million). By Thursday, its fifth day of release, the film had made $135.3 million, surpassing the lifetime totals of every solo Marvel film. Through 12 days of release, the film had made $201.39 million in the country. On review aggregator Rotten Tomatoes, the film holds an approval rating of 67% based on 250 reviews, with an average rating of 6.8/10. The website’s critical consensus reads, “Aquaman swims with its entertainingly ludicrous tide, offering up CGI superhero spectacle that delivers energetic action with an emphasis on good old-fashioned fun.” On Metacritic, which assigns a normalized rating to reviews, the film has a weighted average score of 55 out of 100, based on 47 critics, indicating “mixed or average reviews”. Audiences polled by CinemaScore gave the film an average grade of “A–” on an A+ to F scale, while those at PostTrak gave it four out of five stars, and a 69% “definite recommend”. In December 2018, The Hollywood Reporter announced via Warner Brothers Pictures chairman, Toby Emmerich, that the studio is developing a sequel. Discussions of a followup film began during post-production when director James Wan confirmed to TotalFilm, that the first movie leaves room for further stories. Jason Momoa announced to SyfyWire that he has the beginning for a sequel planned out, and that after a pitch to the studio through Emmerich and Safran, they were receptive and enthusiastic about his ideas.